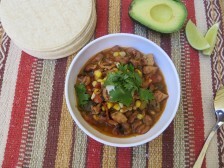 Tony writes: What if you took chili outside to the grill (back to its campfire roots)? The question has nagged at me for the last week as I sweated out a bunch of chili recipes for a magazine article (normal, indoor chili recipes) during a spell of 90+degree stickiness. The technique: This grilled chili method has two basic parts: the grilling and the braise. If you’re going to light up the grill, you might as well grill whatever you got. It’s a flavor thing. It’s also convenient; after grilling the vegetables and meat for a couple of minutes on each side, you can just chop them up, dump them into a pot, and simmer away. Before grilling, coat the chicken with an intense spice rub which will form the aromatic base for the chili. For vegetables, try red onions, Anaheim chilis, fresh corn, and plum tomatoes; though jalapenos, scallions, and bell peppers would also work. Grill everything until it has nice marks, then let cool, and chop. 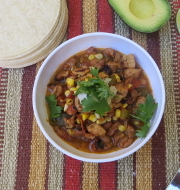 Simmer with beans, spices (a good sprinkling of chili powder and cumin build on the rub for the chicken), and a splash of chicken broth until the mixture thickens and intensifies in flavor. Then serve with cilantro, lime, and sour cream. 1. Spice the chicken: Rinse 1 1/2 lb. boneless, skinless chicken thighs (about 8 ea), then pat dry with paper towel. In a small bowl, make the spice rub: 1 tsp. kosher salt, 1 tsp. chili powder, 1 tsp. sugar, 1/2 tsp. black pepper. Sprinkle over the chicken and toss well with 1 Tbs. olive oil. Marinate for up to 1 day for best results. 2. 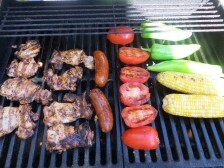 Grill the chicken and vegetables: Prepare a medium charcoal fire or heat the gas grill to medium-high. 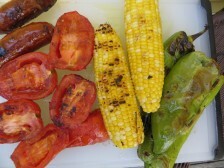 Drizzle 2 Anaheim chiles, 2 ears corn (shucked), and 3 plum tomatoes (halved) with olive oil (about 2 Tbs.) and sprinkle with kosher salt and pepper (1 tsp. and 1/2 tsp.). Set the chicken, 2 links chorizo (about 6 oz.) 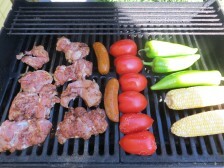 and the vegetables on the grill. Grill until all have good grill marks on both sides, about 3 min per side (or 6 min total). 3. Chop (the chicken and vegetables): Transfer the grilled chicken, chorizo, and vegetables to a cutting board to cool for 5 to 10 min. Coarsely chop all with the exception of the corn (use a paring knife to strip the kernels from the cob; discard the cobs). 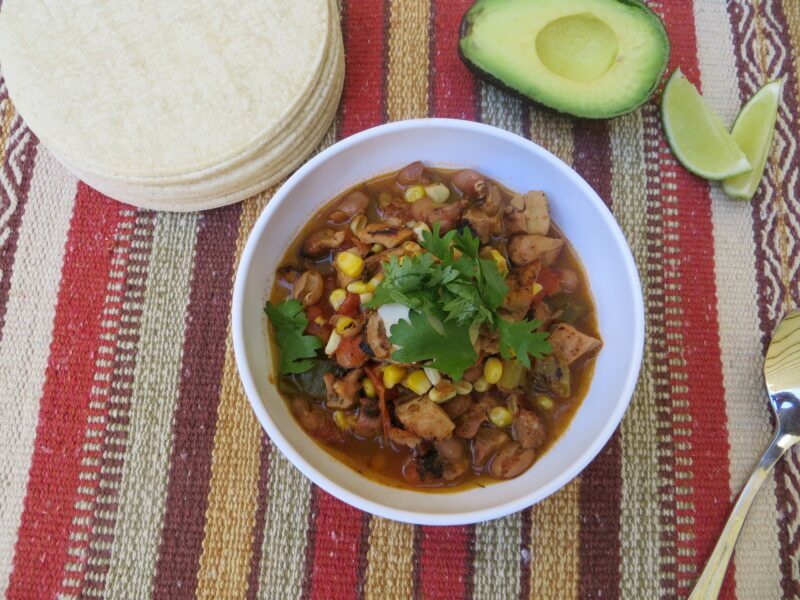 Transfer the chopped chicken, chorizo, and vegetables to a medium pot or Dutch oven. 4. 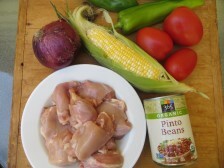 Simmer: To the same pot, add 2 cups chicken broth (or water), 1 garlic clove (smashed), one 28-oz can pinto beans (rinsed and drained well; or use 2 smaller cans), 2 tsp. ground cumin, 1 tsp. chili powder, and 2 bay leaves. Bring to a boil, then reduce to a gentle simmer, cover, and cook until the chicken becomes tender, the broth thickens, and the flavors mix and meld, about 30 minutes. Stir in 1/4 cup chopped fresh cilantro, a squirt of fresh lime juice (1 Tbs., from 1/2 lime) and salt and pepper to taste. 5. Serve: Top with a dollop of sour cream, sprinkle with more cilantro, and serve with warm tortillas.